A South African snake overestimated its appetite when it attempted to digest an entire antelope. 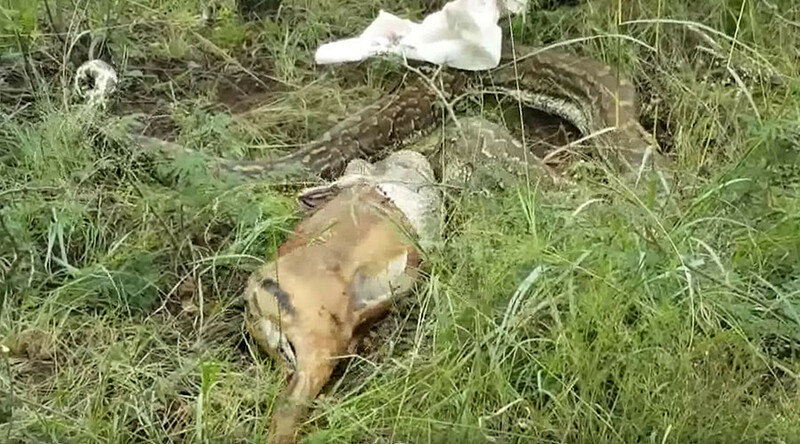 The 3.9 meter python regurgitated the animal, wishing it had ordered a salad instead. Jaco Kotze came across the python on his farm in Groblersdal, in the district of Limpopo. Deciding not to approach the giant snake alone, he enlisted some friends to help capture and move the animal for fear it would attack his livestock, reported Netwerk 24. Startled by being surrounded, the python decided to clear its throat, not uncommon for the species when threatened. Kotze and his friends soon saw hooves protruding from it’s stretched jaw. With its belly emptied, the snake was finally captured and moved to an area away from animals and humans. Last year, a python was discovered on an Australian golf course attempting a similar feat, devouring a whole wallaby. Unlike its South African cousin, it succeeded, much to the horror of onlookers.